Cygnus Instruments Ltd is a well-known and trusted UK manufacturer of high quality ultrasonic testing equipment which is extremely durable and simple to use. Poor maintenance of hatch covers, seals and coamings, resulting in water entering a ship’s hold, can lead to highly expensive or even devastating consequences. Testing that hatch covers are weather-tight is a fundamental requirement for preventing damage to cargo and ensuring the safety of a vessel and its crew. Ultrasonic testing is the most accurate, repeatable and convenient method of testing hatch covers, doors, ventilators and access hatches and is the preferred method of inspection by P&I Clubs but there are others methods in use. Hatches are fully battened down and a surveyor will view the underside of the covers to see if any visible daylight is shining through gaps. If the sunlight level is insufficient a strong torchlight will be shone directly from above instead. This is the simplest method for identifying defects and their location but it may not be so easy to identify very small gaps. markings then it is assumed that these areas are not weather-tight. This method was the traditional way for testing hold cover compression but does not test the watertight integrity of the hold. IACS states that this test should be followed by a hose test. This is an accurate, repeatable and convenient method of testing hatch-covers, doors, ventilators, access hatches, etc. A transmitter emitting ultrasound is placed in the hold and the hatches are then fully closed. On deck the surveyor wearing headphones will walk around the periphery of the covers using a hand-held receiver or detector and will be able to hear ultrasound leaking through any defective seams or joints — even through the smallest of openings. A percentage scale is used with an open hatch emitting 100% of the ultrasound. DNV and ABS state that during an inspection any reading over 10% indicates an area of potential leakage. When a vessel is at sea and is pitching and flexing, seals that were demonstrated to be tight when the ship was stationary might potential leak. A benefit of the ultrasonic method is that the level of compression of a seal can also be detected and monitored through periodic mainte- nance checks. A higher percentage reading indicates a lower level of compression and could indicate a seal which will leak when the ship is in rough conditions. While ultrasonic hatch cover testing has been available since the 1980s, Cygnus Hatch Sure has advanced the current technology with fully automatic Open Hatch Calibration (OHC) to set the Open Hatch Value (OHV). This ensures consis- tent results from hold to hold with a lightweight and extremely powerful 19 × 40Hz element transmitter. This is powerful enough to saturate the largest cargo hold with ultrasound. The variable output transmitter has six selectable power levels allowing the unit to also be used in confined spaces, such as for testing watertight doors. Designed for ease of use and powered by standard rechargeable batteries, the whole system is extremely light and aircraft friendly for passenger transportation. 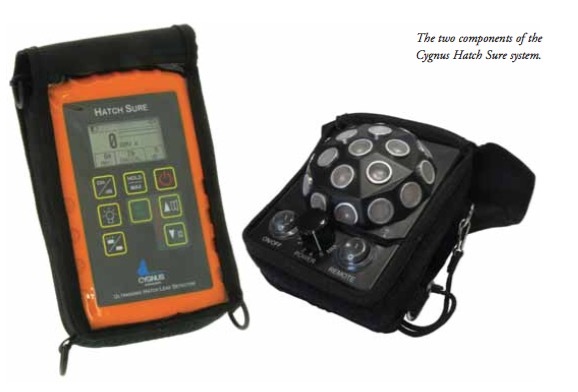 The Cygnus Hatch Sure leak detector is a purpose- designed, robust and very lightweight system; as such it has become the market leader for ultrasonic hatch cover inspections and is the preferred choice of multinational ship management companies across the globe who want to test covers quickly, accurately and cost effectively. Cygnus Hatch Sure is ABS Type Approved and accepted by all P&I Clubs. The Cygnus product training syllabus has been endorsed by the International Institute of Marine Surveyors (IIMS). The Cygnus Hatch Sure system is comprised of two main components (see picture, right): a powerful ultrasound transmitter with 19 x 40 KHz elements and a hand-held receiver. The system is used by placing the transmitter within the ship’s hold, conducting a quick and simple calibration and then closing down the covers. The transmitter is then switched on remotely and it will fill the hold with ultrasound; any ultrasound that escapes will be detected by the operator, who will be on the deck walking around the periphery of the covers using the receiver. Using the sensitive microphone attached to the receiver, the system allows the operator to locate ultrasound leaking through any defective seams or joints; exact locations of potential costly leaks in heavy seas or rain are quickly and easily identified. Cygnus Hatch Sure is entirely designed for ease of use and powered by standard rechargeable batteries.The whole system is extremely light and aircraft friendly for passenger cabin transportation.